This is a cruel policy that recalls terrible mistakes from our history. We cannot be silent about it. At this newspaper, we pride ourselves on providing hyper-local community journalism. In recent weeks, this editorial board has written about such topics as Hillsboro's plans to offer high-speed internet as a public utility, Cornelius residents' embrace of their community's history and civic identity, and the potential impact of a state law about accessory dwelling units on long-established residential communities like Forest Grove. On one national issue, however, we cannot remain silent — nor can we ignore the way it hits uncomfortably close to home. In the past few weeks, countless reports and photographs have emerged from the vicinity of our country's southern border. The scenes they depict are chilling: children, some of them still in diapers, being separated from parents detained by U.S. immigration officials — some caught after illegally entering the country, some after turning themselves in and requesting asylum as refugees — and locked away in cages that more closely resemble the kennels of animals than any place fit for people to live. You can dispute the wording, if it makes you feel better — instead of "cages," as some Trump administration officials and pro-administration media outlets have insisted, call them "chain-link partitions," or, as one wag on Twitter suggested, "freedom rectangles bounded on all sides by ... liberty curtains." You can choose to believe that many of these desperate people trying to cross into the United States have been secretly coached by savvy lawyers to concoct horror stories about the places they have fled in order to petition for refugee status. You can choose to believe that those who are bringing children across the border illegally are doing so for cynical reasons, in order to obtain better treatment or a legal reprieve if they are detained. But what you can't do, and what we can't do, is close our eyes to the simple fact that children are being taken away from parents by our government. We have heard conflicting stories from Trump administration officials about what is happening under the policies being applied here, as well as what those policies even are. The secretary of homeland security, Kirstjen Nielsen, claimed over the weekend that there is in fact no policy of separating families at the border. President Donald Trump himself claimed last week that it is actually congressional Democrats who are "forcing the breakup of families at the Border with their horrible and cruel legislative agenda." Neither of these claims are, perceptibly, true. It is difficult to know exactly what is happening, with misinformation and contradictions coming down from the highest levels of the Trump administration muddying the waters and U.S. immigration officials severely curtailing access to and information about the facilities — including a "tent city" set up last week in an expanse of desert near El Paso, Texas — where children are being held. Even members of Congress, including Oregon Sen. Jeff Merkley, say they have been denied entry when they have asked to inspect some of these facilities. Read The Times of Beaverton, Tigard, Tualatin & Sherwood's story from June 4, 2018, on Merkley's attempt to tour the detention facility. But we've seen some of those reports and photographs on what takes place inside. A government contractor quit his job at an Arizona "shelter," he told the Los Angeles Times, after being instructed to tell three siblings who had been separated from their parents at the border that they were not allowed to hug one another. An advocate who visited a Texas facility told the Associated Press that no toys and books were provided to children there, that she had spoken with one 16-year-old who said it had been up to her and other girls in her holding pen to change the diapers of a toddler placed there with her, and that in one instance she witnessed, staff scolded children simply for playing together. A doctor who toured another shelter in Texas told the Washington Post that while staff there did provide toys, play areas and diaper changes, children were nonetheless suffering obvious emotional and psychological trauma from being separated from their parents. Murkier still is the process of "reunification" — ensuring that the separation of families by U.S. authorities is, in fact, temporary. Under a new "zero-tolerance" mandate issued last month by U.S. Attorney General Jeff Sessions, most people accused of unlawfully entering the country are now facing criminal prosecution for the misdemeanor of illegal entry, instead of civil proceedings to deport them back to their country of origin. Some of those parents are being held right here in Oregon, in the medium-security prison in Sheridan, after having their children separated from them by federal authorities. Read the Portland Tribune's June 17, 2018, story on lawmakers' visit to the prison in Sheridan. If parents and children are detained separately and deported separately, that can make reunification extraordinarily challenging. What's more, many of the families crossing the border come from places where there is civil unrest, such as Nicaragua, which has appeared for months to be teetering on the brink of revolution, or violence perpetrated by gangs and cartels that oppress and terrorize the innocent, as in parts of Mexico and Honduras. That adds another layer of complexity to the situation. As the editorial board of a small community newspaper office, we don't claim to know how to solve our country's immigration issues. We are glad to see Congress continuing to debate and disparate groups of lawmakers coming together to find solutions, as well as people marching and protesting for what they believe is right. The truth of the matter is that both closing down the borders altogether and erasing borders from the world map are both extreme fringe positions, and in between those poles, there is a vast continuum of ideas and possibilities. 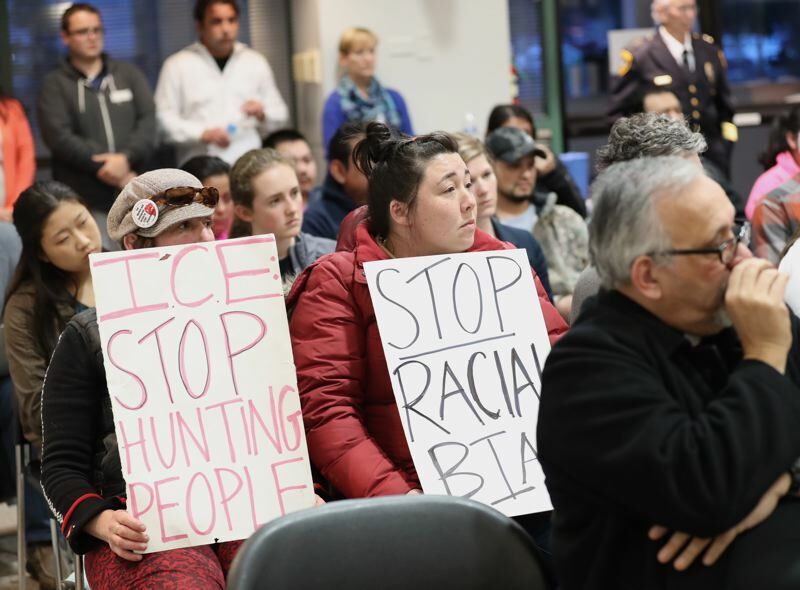 Read our story from June 18, 2018, on protests in Hillsboro against federal immigration policies. We know you're used to seeing — and perhaps you're more comfortable seeing — our weekly editorials focus on our local cities, schools and businesses. But we cannot remain silent in the face of this crisis of conscience. We cannot see a child at play in Hillsboro or Forest Grove and pretend a lump does not rise in the back of our throat imagining that child behind a metal barrier, not knowing where her parents are and when or if she will ever see them again. We cannot accept the thought of our own children screaming for us as they are bustled into the back of a van and taken away. We cannot shrug our shoulders, look away and hope tomorrow brings a better day, rather than carrying us further down a slippery slope at a time when Washington County residents — many of them without felony records — are already among those whom immigration authorities have been scooping up since early last year. Finding solutions is difficult, and striking the balance between securing our borders and treating people in impossible situations with just compassion is one of the most challenging problems facing our country's leaders and law enforcement officials. But this practice of forced family separation is wrong. It is not "tough," it is cruel. It is not "necessary," it is gratuitous. And before we continue down the same road that led to Native American boarding schools and Japanese American internment camps, we need to make a U-turn back to the 21st century, instead of revisiting the horrors of the past.